POLITICAL TIDBITS: ICC’s Fatou Bensouda will be on President Duterte’s back for one whole year yet, as provided by the Rome Statute that set up the ICC---even though he really hates her guts. ICC’s Fatou Bensouda will be on President Duterte’s back for one whole year yet, as provided by the Rome Statute that set up the ICC---even though he really hates her guts. Three months ago, my dzRH partner Cecile Guidote Alvarez and I were at the Clark Exposition Center in Pampanga, to attend the big celebration of the famed Kapampangan Culture and Cuisine, at the invitation of former President and now Pampanga Rep. Gloria Macapagal Arroyo. President Duterte, the guest of honor, arrived very much late but the guests waited for him. 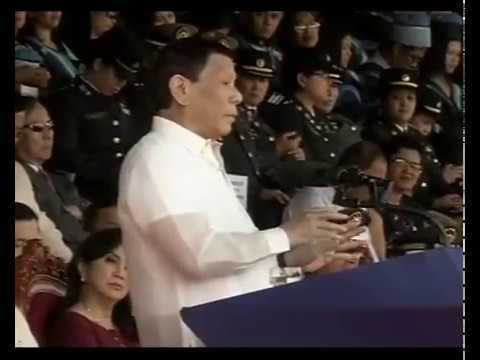 When he spoke, I thought it was one of the finest I had heard from Mr. Duterte. He spoke obviously quite from the heart---no expletives whatsoever!---only soft and seemingly sincere words to describe his anguish over the rampant drugs destroying the flower of our youth. At some point I thought he would cry. The audience in the cavernous hall hung on to his every word. After his speech, Cecile and I decided to break through the security cordon until we came face to face with the President. With the PSG virtually glaring at us, I confessed to Mr. Duterte that while I didn’t vote for him for President, I was quite touched by his very sincere remarks---his sentiment for Filipino youths who are being wasted away by drug devastation. We stood eyeball to eyeball and then instinctively I grabbed his hand to make mano po, just to show him how touched I was by his expletive-free, straight from the heart speech about saving our Filipino youths. In turn the President grabbed my hand and returned the mano-po gesture. I remember telling myself later: if only Mr. Duterte and International Criminal Court Prosecutor Fatou Bensouda could indulge in the gesture Mr. Duterte and I exchanged in Clark, how amiable it would be all around---instead of his hating her guts and I suppose she his. Fatou Bensouda is one tough cookie. A Gambian lawyer and international criminal law prosecutor, she was former Minister of Justice in The Gambia, a state in West Africa entirely surrounded by Senegal, except for its western coastline on the Atlantic Ocean. 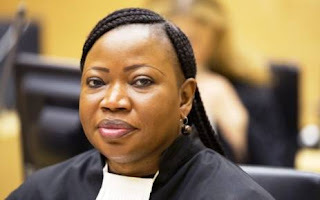 Bensouda subsequently became ICC deputy prosecutor from 2004, and eventually its chief prosecutor. That Clark speech where Mr. Duterte spoke straight from the heart was some months back. In recent days, he's back to spewing acidic remarks like a volcano---this time his target is the International Criminal Court that, he says, has hurled “baseless accusations” against him and failed to accord him due process. His violent reactions came a month after Fatou Bensouda had declared that she would start preliminary examination of a complaint accusing Mr. Duterte of crimes against humanity---in connection with his bloody war against drugs that has resulted in the killing of thousands of Filipinos. Calling the accusations against him rude and intended to paint him “as a ruthless and heartless violator of human rights,” Duterte also blasted the European Union for leading the international clamor for an independent investigation of the drug killings here. Actually moves to investigate our drug situation came after Filipino lawyer Jude Sabio, who had rendered legal service to self-confessed Davao Death Squad hit-man Edgar Matabato in times past, filed his complaint vs. the President before the ICC. UN officials and those of the ICC tried to appeal to the President not to follow through on his decision to withdraw, inasmuch as the Philippines is considered an important party to the ratification of the ICC. This is true, for this blogger, at that time a columnist of the Philippine Daily Inquirer, had followed up on the various negotiations that led to the ratification of the Rome Statute by 120 countries on July 17, 1998. The Statute led to the setting up of the ICC, with the Philippines in fact, leading the countries of Southeast Asia in campaigning for its ratification and setting up the ICC. But there are several complications he must first reckon with. One is that the Philippine Senate, which is empowered by the Constitution to ratify any treaty or international agreement by a 2/3 vote of all its members, should ipso facto be also empowered to agree to Mr. Duterte's avowal to withdraw from the Rome Statute. But the Senate has not yet done so---hence, our commitment stays. Secondly, while UN Ambassador to the UN Teodoro Locsin has already notified the UN Secretary-General of the country's withdrawal from the Rome Statute, Article 127 of this document provides that such withdrawal will take effect ONE YEAR AFTER THE OFFICIAL NOTIFICATION. This means that any action taken against the withdrawing country by the ICC will continue to take effect for one year. Thus, Mr. Duterte hasn’t seen the end of the feisty Fatou Bensouda yet.